* Prepare brownie mix as directed. Place mixture in bottom of 13x9 greased pan. * Blend butter, cream cheese & sugar together until smooth. Add eggs, vanilla and flour - mixing until combined and smooth. * Spread cream cheese mixture over brownie mixture. * Bake for 40-45 mins until set and slightly brown on top. 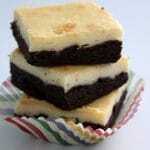 * Score tops of Cream Cheese Brownies while still hot - making it easier to cut when cooled.